Given all the other services that have been swept away via Google's "Spring Clean", I knew there was going to be others. 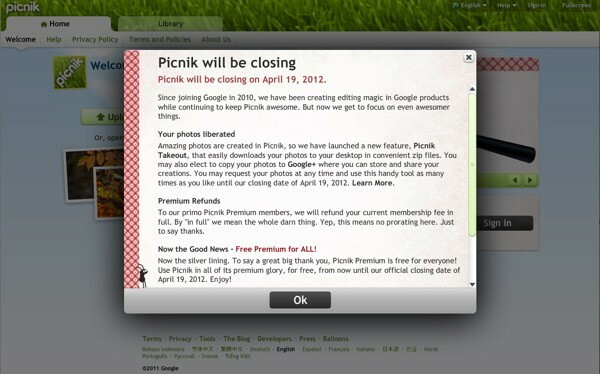 And now you can welcome Picnik to the slew of services. But wait, it is not going away forever. The service is going to be shut down, but it will be integrated into Google+. In an exact statement, it is moving over to Google+ to "focus on even awesomer things". But as seen in the picture above, you can enjoy their Premium Service until their doors close as a thank you. If you ponyed up cash for the premium service, you will receive a full refund as well as a thank you.